This past weekend I was in Nashville, Tennessee! I had an absolute blast on the trip. Nashville has become the #1 most popular destination for bachelor/bachelorette parties so I would definitely recommend it if you wanted to go on a fun trip with your friends that like to go out and party. The bars were great, the people were great, the music was great, and the food was great! The Pantheon was cool to see as well as the Country Music Museum. I loved the prints at Hatch Print show! Belle Meade Plantation was cool and had a free wine tasting. The Shoppes on Fatherland also had great shops, I loved Rusty Rats Antiques!! We purchased a $75 Music City Total Access Pass that was very helpful. I don’t really know all the places we drank, but anywhere on Broadway has good music and is a good time. I would 10/10 recommend the Hick Chick Pub Crawl – it was soooo fun! I had great moonshine at one of the bars on this tour. Once again, I used AirBnB for my weekend trip. We stayed three nights, four days and it was around $400 – split 4 ways, it was very cheap. I do recommend using AirBnB, I’ve had nothing but good experiences. The apartment was beautiful and a close uber ride, the host was extremely helpful, and I think it makes for an overall better vacation experience. Yay! I am so glad you had a good time! Nashville is such a great city! 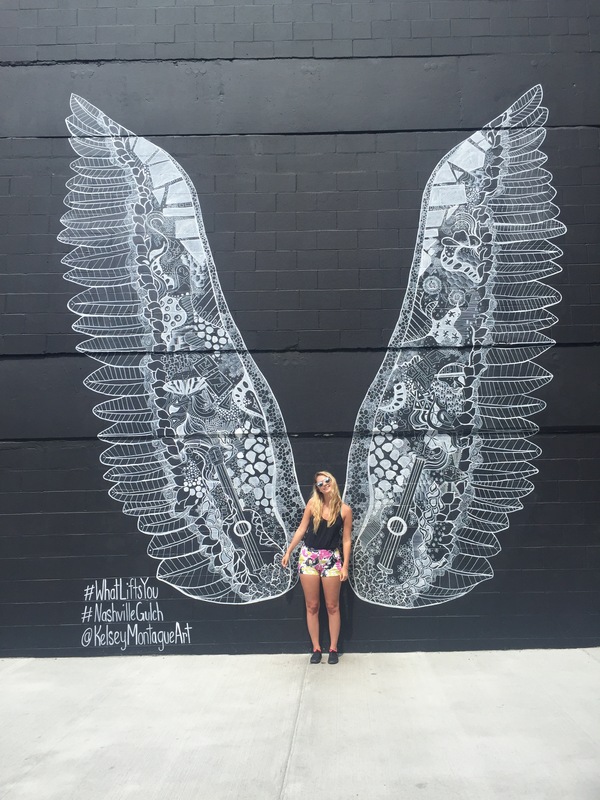 Nashville is so on my list of places to check out! Ahhh I am sharing this post with a friend and am gonna try to go this fall! So glad you had a great time and now I’m thinking of doing air b&b! I will be messaging you for sure! Thanks Rosie! Thanks 🙂 loved that mural! Nashville was great! I originally went thinking I’d tag along with my wife on a work trip, but we have lots of fun! I’m coming around to at least some country music, but we couldn’t get to the Grand Ole Opry because it was closed. However, if you ever go back to Nashville, you have to get to the Ryman Auditorium. It’s incredible.